Beautifully restored, modernized, and fully equipped. Classic Gulfstar Trawler with cockpit extension, hard enclosed fly-bridge, fiberglass hardtop and Isinglass enclosure for rear deck. Recent Awlgrip paint, New Trac stabilizers, inverter, charger, controls, tender, electronics, sat phone, TV, and lots more. Roscioli cockpit extension, flybridge enclosure and engines in 1991. Trac Stabilizers in 2009. Boasting upgrades to all systems, all work professionally done to high standards. Islander's spectacular customized and renewed solid teak interior shows pride of ownership. The interior quality will rival that by any builder. This is a beautifully restored and updated, full displacement, long range trawler. A rare opportunity to purchase a classic boat in wonderful condition. Price reduced $80,000 to effect an immediatesale! 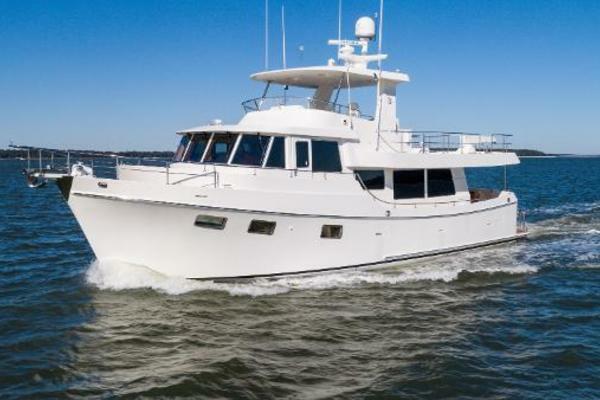 United Yacht Sales New Jersey would love to guide you through a personal showing of this 60' Gulfstar Custom 53/60 Mkii Trawler 1976. This yacht for sale is located in Saint Petersburg, Florida and priced at $248,000. For a showing please contact us by filling out the form on this page and we will get back to you shortly! Features three staterooms, 2 heads, galley and dinette down, Lower helm, and full beam aft stateroom, with an enclosed fly-bridge and aft deck, with a cockpit extension. Lots of high quality custom improvements all beautifully done to create a one of a kind all teak interior. A true showpiece. 6 foot 5 inch headroom. Wide walk around fiberglass decks. shallow draft, all new modern equipment. Solid teak interior completely restored and refinished in 2016 with lots of custom teak woodworking, teak overhead battensand parquet soles. Tempered safety glass salon windows and frames installed 2008. Polished stainless portholes throughout in 2008. All new headliners, lights, furnishings and upholstery. We begin in the bow with a the V-berth stateroom with twin berths, overhead hatch, and a hanging locker to starboard.The new in 2016 built-in washer and dryer is to port. Next aft to port is a guest stateroom with upper and lower berths, the upper running athwart-ship at the aft bulkhead; drawer storage beneath the lower berth and hanging locker forward. The forward head is opposite with a separate shower stall that includesa molded bench seat. 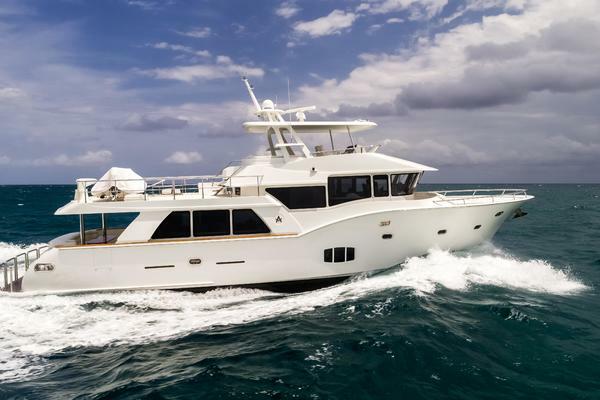 The passagewayleads further aft to the over-sized gourmet galley to starboard with all new Corian Counters and custom cabinetry with L shaped solid Teak dinette to port. Teak parquet cabin sole in galley and hallway. New Full sized Stainless Steel Refrigerator and Freezer in 2016. Continuing aft and up, the salon offers a lower helmforward with port and starboard teak access doors to the decks. The Standard Salon settee was replaced with a new settee in 2016.The teak entertainment console is a focal point of the all new salon. All new custom lighting accent the beauty of the warm teak interior. with custom teakstorage cabinets at floor level. The lower helm was completely modernized and renewed with all new digital instruments and controls. All wood working was done using beautiful "Book End" matched teak.. Teak stairs at the aft end of the salon on the port-side lead down to the remodeled (2010) master stateroom withcenter-linequeen berth offering a hydraulic liftthat tilts the berth to any sleeping angle you may desire. There are teak night stands, Corian counter-tops and desk space, lockersand a built-in love-seat.All new 110V circuits and lighting. The master head, also renewed in 2012,is starboard side forward with stall shower, new lighting and granite counter-top and custom teak storage drawers. The stateroom and head were gutted to the bare walls and completely renewed with grain matched solid teak. The Aft deck is under hardtop with enclosure curtains, wet bar with refrigerator, sink,ice-maker, and tablewith chairs (2010). The hardtop supports the davit with dinghy in chocks. All counter tops in Corian. The fly-bridge has a custom solid enclosurewith hinged windows, full upper helm station, bench seating, Deluxe over stuffed Helm Seat. Awlgrip hull Flag Blue,Topsides awl-gripped painted, all brightwork renewed, new stainless opening port-lights,Stainless Steel rub-rail new- 2013 Constant quality improvements over the past years with hundreds of thousands of dollars in quality improvements and restorations. A state of the art Electronics package with back up systems for cruising safety. State of the art modern stabilizers and every mechanical system replaced or serviced in the past 5 years. This is a full displacement hull with a deep keel that protects the running gear. She features solid fiberglass integral fuel and water tanks below the decks for added stability. Vessel was hauled for bottom paint and complete servicing in November 2017. This is a true classic yacht with an interior that will rival any in beauty, fit and finish. Her paint and bright-work sparkle and she is pleasure to show. In turn key condition and ready to go cruising. This is a preliminary Listing and awaits edit of the owners. Any specific item or detail is not assured. The Company offers the details of this vessel in good faith but cannot guarantee or warrant the accuracy of this information nor warrant the condition of the vessel. A buyer should instruct his agents, or his surveyors, to investigate such details as the buyer desires validated. This vessel is offered subject to prior sale, price change, or withdrawal without notice.